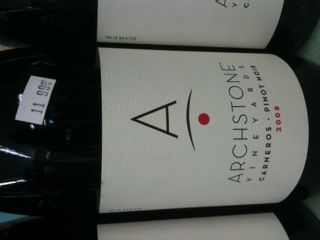 Today we are trying the 2008 Archstone Pinot Noir from Carneros. We’ve been talking about the rumors for a while that high-end producers are selling off their wines under other monikers and this is what we have heard about this wine as well. 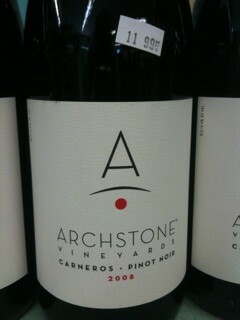 THIS DOES NOT TASTE LIKE A $11.99 WINE!! It has a nice nose of cherry, earth and a touch of cinnamon. The palate is where this delicate wine really shines though with flavors of cherry, raspberry, cola, and a touch of earth. We could not believe this when I tasted it. Stop in and try it for yourself! This entry was posted in Uncategorized by oxfordliquor. Bookmark the permalink.